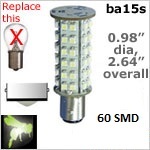 60 SMD Tower Style LED replacement bulb. Ba15s socket type plugs into any single bayonet receiver easily. Huge light out of 60 SMD LED bulb. This LED is able to function on an input of 10-30 volts DC.